Our latest Mountain Mover is a familiar face on the Mars Hill University campus and in the community. 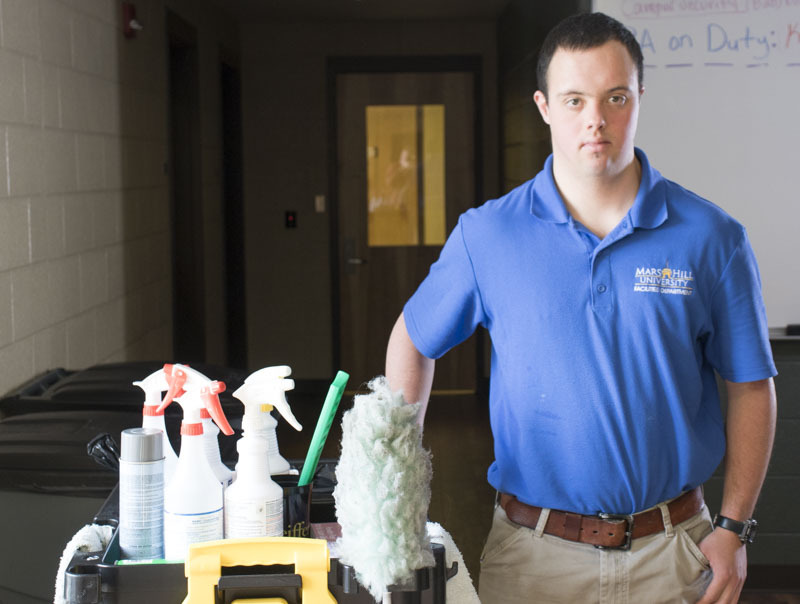 We talked to Zach Benton on the day after World Down Syndrome Day about his experiences working at the university. Zach Benton, on the job in Laurel Residence Hall at Mars Hill University. After attending college at Western Carolina University, Zach Benton got a job bagging groceries at Ingle’s that allowed him to get his own apartment. Now-retired Mars Hill town manager Darhyl Boone connected him with the university when a position opened up in Pittman Dining Hall. Growing up in Mars Hill, Zach says he’s always wanted to work here. “I wanted to work at Mars Hill University because it felt like home to me,” Zach says. Not long after taking that first campus job in food service, Zach moved to the facilities department with a job as a housekeeper. He’s been assigned to Wren Student Union and Chambers Gymnasium, and now serves as the housekeeper for Laurel and Dogwood residence halls. At Western, Zach went through the University Participant (UP) Program. It’s an inclusive, two-year, on-campus living and learning experience for college-aged persons with intellectual disabilities. UP students live in the university residence halls with other students and take the same classes as other WCU students. Zach is one of the program’s success stories, completing the program’s requirements in personal development skills, community participation skills, vocational preparation skills, social participation and learning, and course auditing. He graduated with his UP Certificate of Accomplishment in 2015. Ruby’s Rainbow founder Liz Platcha keeps in touch with Zach, posting updates to the organization’s supporters as he achieves new dreams: graduating the college program, getting a job and apartment, earning belts in karate, running his first half-marathon. Zach now is on the Ruby’s Rainbow advisory board. 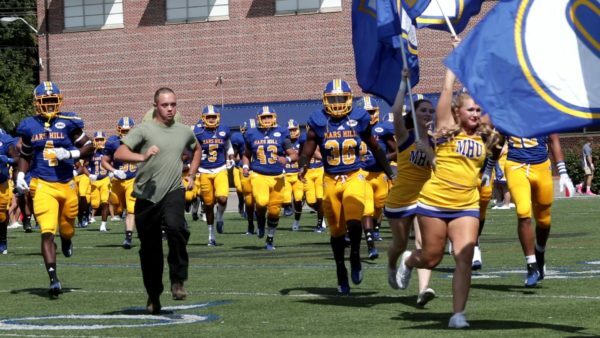 Zach Benton leads the Mars Hill University football team onto the field for a home game in Meares Stadium.